JAMES MCGRATH: The Bible’s Cutting Room Floor. Review of Joel M. Hoffman's new book, The Bible’s Cutting Room Floor: The Holy Scriptures Missing From Your Bible (St. Martin's Press, 2014). In this collection scholars of biblical texts and rabbinics engage the work of Barry Schwartz, Professor Emeritus in the Department of Sociology at the University of Georgia. Schwartz provides an introductory essay on the study of collective memory. Articles that follow integrate his work into the study of early Jewish and Christian texts. The volume concludes with a response from Schwartz that continues this warm and fruitful dialogue between fields. Tom Thatcher is Professor of Biblical Studies and Chief Academic Officer at Cincinnati Christian University. He is the author or editor of numerous books and articles on the Johannine literature and early Christian media culture, including Why John Wrote a Gospel (Westminster John Knox, 2006), Jesus, the Voice, and the Text (Baylor University Press, 2008), and the co-edited The Fourth Gospel in First-Century Media Culture (T&T Clark, 2011). Mirjam van der Vorm-Croughs was a junior researcher at the Faculty of Theology at Leiden University on “The Septuagint of the Book of Isaiah” project from 2004–2010. As a translator and author at the Dutch Bible Society in Haarlem, the Netherlands, she is currently involved in production of a new translation of the Bible in simple Dutch. Follow the links for ordering information and additional details. WEBSITE: National Treasures from Israel Antiquities Authority Now Accessible Via Internet. The archeological treasures in the Rockefeller Museum of Jerusalem can now be accessed online (Jewish Press Staff). Thousands of archeological artifacts presently stored in the Rockefeller Museum in Jerusalem will be made available online through a new initiative called the National Treasures Online project. This new project and the Rockefeller Museum Online project are just two online projects undertaken by the Israel Antiquities Authority. These new ones join the Dead Sea Scrolls Digital Library, the National Archives and the Survey Maps online. The National Treasures Online site includes objects from collections of the National Treasures, from prehistoric periods through to the Ottoman period. It currently includes 5,700 artifacts and is continuously updated. For the Dead Sea Scrolls Digital Library, see here and links. GOLDEN, GET IT, GET IT? Biblical Archaeology Sees Golden Age in Israel, Dark Age in Rest of Middle East (Sean Savage/JNS.org/BreakingIsraelNews). The artifacts mentioned in the article have been covered previously by PaleoJudaica. For the Byzantine-era coin hoard, see here. For the golden medallion, see here. For the golden earring, see here. And for the golden bell, see here and links. Another copy of the Copper Scroll exists, although I’m not sure exactly where, somewhere in the bowels of the University of Chicago. David Wilmot, of blessed memory, prepared a copy as part of his dissertation research (see Michael O. Wise, “David Wilmot and the Copper Scroll,” in G. J. Brooke and P. R. Davies, Copper Scroll Studies (London, T & T Clarke, 2002) 291ff.) His students and friends were treated to a play-by-play description of the vicissitudes of this construction; Allegro had described the gauge of the copper as being that of three British postcards, so there was a lot of measurements of late-40’s postcards, that kind of thing. Wilmot received his PhD posthumously, and I don’t know what happened to his replica; it might be in the collection of the Oriental Institute, although his PhD was, I believe, in the Humanities Division. Can any other readers shed light on the fate of Dr. Wilmot's replica? But then, at many points in the Talmud we read about a father being chastised by the loss of his children, or a husband by the loss of his wife. A family, in the Talmudic view, was not a collection of individuals but a man’s possession, which could be taken from him if he sinned. In this way, the rabbis tried to find some modicum of logic, of cause and effect, to loss. If you are punished, it must be because you deserved it. Likewise, in Moed Katan 18b we read that a person is never accused of a crime unless he is at least somewhat guilty: “A man is suspected of having done something wrong only if he has indeed done so. And if he did not do it wholly, he did it partly. And if he did not do it even partly, he thought in his heart to do it. And if he did not think to himself to do it, he saw others doing it and was happy.” To the rabbis, anything seemed preferable to acknowledging that life, with all its grief and suffering, might simply be random. Rabi Yosi ben Kisma was very ill. Yet, when Rabi Chananya ben Teradyon came to visit him, Rabi Yosi took the opportunity to strongly admonish his colleague for disobeying the Roman edicts. “Hashem will have mercy on us,” replied Rabi Chananya. “I am speaking rationally and you answer me with ‘Hashem will have mercy on us’? I wouldn’t be surprised if the Romans burned you together with a Torah scroll” (Avodah Zarah18a). As we know, Rabi Yosi’s words were fulfilled. Both the Talmud and the medieval piyyut Eleh Ezkerah, which we read on Yom Kippur during Mussaf, describe the fiery death of Rabi Chananya, one of the Ten Martyrs, at the hands of the Romans. Yet, this same Rabi Chananya, who fearlessly defied the edict of the Romans that forbade the teaching and studying of Torah, understood that not every Jew could be expected to have his courage. He therefore encouraged those who were afraid to learn Torah in public to at least learn in private. The various recensions of the Story of the Ten Martyrs have been collected in an excellent German edition by Gottfried Reeg: Die Geschichte von den Zehn Märtyrern: Synoptische Edition mit Überstezung und Einleitung (Tübingen: Mohr Siebeck, 1987). And I have noted another book on the subject here. As I have mentioned before, an alternate, subversive, and macabrely upbeat version of the Story of the Ten Martyrs is found in the Hekhalot Rabbati (§§107-121). In this version R. Chanaya (Hananiah) was shapeshifted, terminator-like, to take over the identity of the evil (and entirely legendary) Roman Emperor Lupinus. R. Hananiah then spent six months terrorizing the Roman army, after which Lupinus was miraculously transformed to have the appearance of each of the ten martyrs successively, in order that the execution of each could be inflicted on him while they were all spared. You can read this story on pages 66-77 of my translation of the Hekhalot literature or you can read an earlier draft of the translation which I circulated with an SBL paper back in 2008. And Ra‛anan Boustan has published a very interesting book on the Hekhalot Rabbati which focuses on this story: From Martyr to Mystic: Rabbinic Martyrology and the Making of Merkavah Mysticism (TSAJ 112; Tübingen: Mohr Siebeck, 2005). ARASH ZEINI: Introduction to Avestan. TEMPLE MOUNT WATCH: PM orders halt to Temple Mount bridge construction (Shlomo Cesana, Times of Israel). Two weeks ago, construction work began on new bridge connecting Western Wall plaza to Temple Mount's Mughrabi Gate • Work started "without coordination with or approval from the prime minister, and therefore it was stopped," PMO officials say. It's been a couple of years since the last installment of the Mugrabi (Mughrabi, Moghrabi) Gate Bridge saga. Apparently someone lost patience and took matters into their own hands. But now the status quo of doing nothing has been restored. Background here with links going back a decade to the embankment collapse that led to the building of the temporary and now unusable bridge. ARAMAIC DAY: Annette Yoshiko Reed, “From Didactic List to Long-Duration Literature: The Enochic Astronomical Book and Aramaic Jewish Scribalism in the Early Hellenistic Age.” History of Material Texts Workshop / 8 September 2014 5:15pm, Class of 1978 Pavilion, Kislak Center Van Pelt-Dietrich Library, University of Pennsylvania. Follow the link for the abstract. Wish I could go. Cross-file under "Aramaic Watch." This October we are beginning a similar custom of studying a daily page of the Zohar. We have decided to study an ammud yomi, “a daily ammud” of Zohar. An ammud is half of a daf, that is, a single side of an Aramaic page of Zohar (such as Zohar 1:1a or Zohar 1:1b). The reason we are planning on studying a daily ammud rather than a daily daf is that the Zohar is so dense and demanding that a single page (that is, one side of a page) is challenging enough. We are beginning Zohar Ammud Yomi (A Daily Page of Zohar) on the 20th of Tishrei 5775 (the 6th day of the festival of Sukkot), which corresponds to Monday night, October 13 – Tuesday, October 14, 2014. We have prepared a calendar for the first month, covering Zohar 1:1a-16b, running from October 13/14 through November 14. This calendar (posted below) lists each daily ammud (according to the traditional Aramaic pagination) and the corresponding English pages in The Zohar: Pritzker Edition, Volume 1. We estimate that we will complete the first volume (of the Pritzker Edition, which extends through the Torah portion Noah) in early 2015, following which we will proceed with Volume 2 (which opens with the Torah portion Lekh Lekha). Daniel Matt and Rabbi Elie Spitz are coordinating Zohar Ammud Yomi. Rabbi Spitz and a number of others have committed themselves to this daily practice of study, and more folks will soon join. Rabbi Spitz has graciously agreed to occasionally post comments (relating to some of the daily Zohar passages) to this Zohar Facebook Group https://www.facebook.com/groups/theZohar/. Daniel Matt will also contribute occasionally. Members of this Facebook group are invited to join Zohar Ammud Yomi (A Daily Page of Zohar) and to participate in the online discussion. For now, this Zohar Facebook Group will serve as the hub of Zohar Ammud Yomi (A Daily Page of Zohar). The schedule of the discussion, commencing on 13 October, follows. To follow the postings you must be on Facebook, where you can join the Zohar group. Should be very interesting. HT Judy Barrett. Cross-file under "Aramaic Watch." More on the Zohar, and on Daniel Matt's Aramaic edition and English translation of it, here with many links. We have about 2,000 ostraca with inscriptions in Aramaic, the language the Jews brought back from Babylon following the end of the Babylonian exile in 538 B.C.E. Many of the ostraca record the delivery of products to and from storehouses and include the year of the present ruler’s reign. Idumea and Judea were under Persian rule at this time until the empire fell to Alexander the Great around 333 B.C.E. The article itself is behind a subscription wall. Cross-file under "Aramaic Watch." ARAMAIC DAY: Supernatural Syriac (Exploring Our Matrix). James McGrath noticed that a Syriac manuscript has a cameo in Supernatural and he promptly went and identified the manuscript, which, of course, has nothing to do with the storyline in the episode. I haven't watched Supernatural myself, but I have noted that the archangel Metatron is one of the characters in it. Cross-file under "Syriac Watch" and "Metatron Watch." ARAMAIC DAY: I have a huge heap of links from the last week or so, to which I will get as I find time. Today I have gathered up some that deal with Aramaic (in all its dialects). First: 8th World Syriac Conference Opened (AINA). Kottayam, India -- The 8th World Syriac Conference got under way at St Ephrem Ecumenical Research Institute (SEERI) at Baker hills near here on Monday. MORE FROM MANCHESTER: One of world’s earliest Christian charms found. A 1,500 year old papyrus fragment found in The University of Manchester’s John Rylands Library has been identified as one the world’s earliest surviving Christian charms. The remarkable document uniquely contains some of the earliest documented references to the Last Supper and ‘manna from heaven’. It is the earliest surviving document to use the Christian Eucharist liturgy - which outlines the Last Supper - as a protective charm. Dr Roberta Mazza, a Research Fellow of the recently established John Rylands Research Institute came across the Greek ‘amulet’ while working on thousands of fragments of unpublished historical documents that are kept in the library’s vaults. The document had been held at the library since around 1901, but its significance had not been realized until Dr Mazza spotted it. She said: “This is an important and unexpected discovery as it’s one of the first recorded documents to use magic in the Christian context and the first charm ever found to refer to the Eucharist – the last supper – as the manna of the Old Testament. The text of the amulet is an original combination of biblical passages including Psalm 78:23-24 and Matthew 26:28-30 among others. “To this day, Christians use passages from the bible as protective charms so our amulet marks the start of an important trend in Christianity. I saw Dr Mazza in the audience, and Hannah Cotton was sitting directly behind me, but I didn't get a chance to introduce myself to either of them or to thank Dr. Mazza for organizing the conference (so let me do the latter here and now). Both papers were excellent. Dr. Nongbri's paper will be of special interest to New Testament scholars. P52 is reputedly the oldest fragment of the New Testament, specifically of the Gospel of John. It is generally accepted to have been written during the first half of the second century CE, some would say around 125, which would put it within living memory of the composition of the Gospel of John itself. In his presentation Dr. Nongbri added additional evidence to his already-published arguments that the date of the papyrus is much harder to pin down and that manuscripts with comparable scripts which bear dates in their text range from the time of Hadrian to the early third century CE and that P52 could have been copied anytime during that date range. If he is correct, P52 would still be one of the earliest surviving fragments of the New Testament, but not necessarily the earliest or copied within living memory of the original manuscript of John. 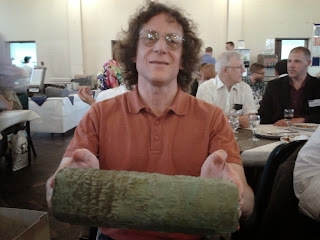 THE JEWISH CHRONICLE: Copied copper scroll is one to treasure (Simon Rocker). A couple who have made high-quality facsimiles of illustrated medieval manuscipts and even of the Dead Sea Scrolls have embarked on their most difficult challenge yet - to make a replica of the mysterious Copper Scroll. 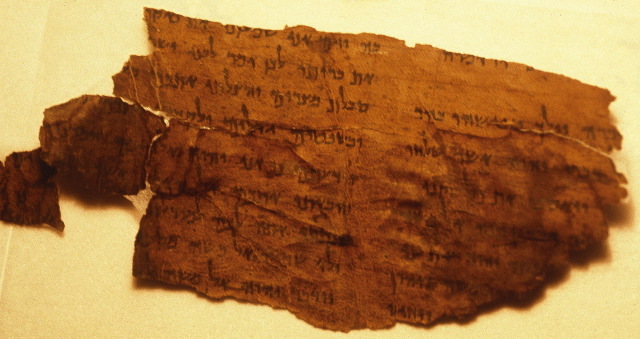 The 2,000-year-old metal object, discovered in one of the Dead Sea Scroll caves in Qumran in 1952, appears to be a treasure map giving clues to the location of precious artefacts from the Temple in Jerusalem. After two years of trial and error since beginning their attempt, Michael and Linda Falter of Facsimile Editions, London believe they have at last cracked it. UPDATE (11 September): News of yet another Copper Scroll facsimile here. THE TALMUD BLOG: Stray Thoughts on Art History and Talmudic Philology (Shai Secunda). Matthew Thiessen reviews Christian Frevel and Christophe Nihan (eds.) Purity and the Forming of Religious Traditions in the Ancient Mediterranean World and Ancient Judaism. Noted earlier here. H-JUDAIC: TOC: Jewish Quarterly Review - ToC Vol. 104.3 Summer 2014.